We made a ESP32 board and server-side system to let people to use this board from their HTML web browser. Our project “obniz” is what we, and maybe you, wanted. obniz is ESP32 board, and We also provide server-side system (we named it “obniz cloud”). After WiFi connection setup, an obniz is always connected to obniz cloud as long as WiFi available. And your obniz is able to be controlled from APIs on obniz cloud. So, you don’t need to know IP address, open firewall, and prepare APIs. obniz let people to use hardware as API. SDK and Apps are not needed to use obniz. just a browser is needed. Also, we provide the HTML edit and hosting system on obniz cloud. 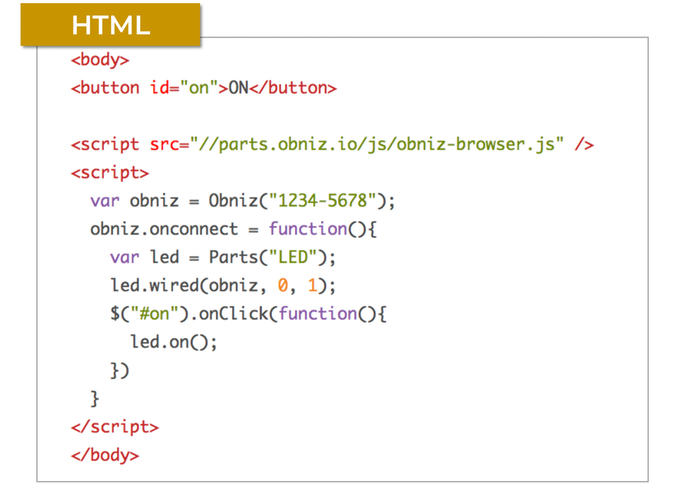 and obniz.js is available as js library. It’s program url is showed on your obniz OLED display as QR code. Just scan the QR code, then program page will appear. Easy to program and run it. Smartphone is enough to program. It js runs on various modern browsers. Even if smartphones. obniz is not just ESP32 soldered board. Most significant feature is “up to 1A”. obniz has fast motor-drivers on each IO. When you choose “5v push-pull” then, the IO is able to drive up to 1A. So you can connect motors and power supply of something else board can be connected directly. This is example of GoogleHome integration. We started kickstarter project to mass-product obniz. Cool, I will checkout your links today!